Creating a better world for all through a free tree planting game platform is the endeavour of a Korean social venture, Tree Planet. Double A paper supports this initiative. Bangkok, Thailand – Double A hosted the Executives of Tree Planet, the maker of Tree Planet 2, a free game application that allows smart phone and Facebook users to plant trees in Thailand, Korea, Republic of Sudan and Mongolia. 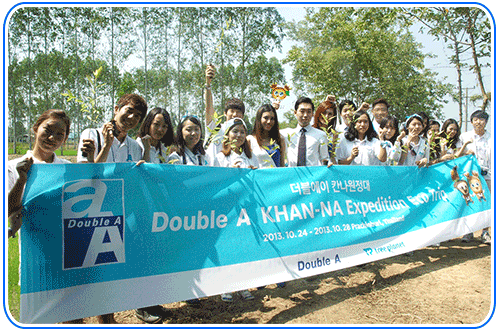 They were accompanied by the members of Double A KHAN-NA Expedition Team, a group of Korean University students who are actively promoting the environment through blogs and social media. Real trees were planted along the paddy ridge of Double A contract farmers at Nakorn Nayoke province. After 3-5 years, these trees which were virtually grown by KHAN-NA Expedition members and players around the world through Tree Planet 2, will provide sustainable fiber to Double A and additional income to Thai farmers. Mr. Thirawit Leetavorn, Double A Senior Executive Vice President said, “Tree Planet and Double A share the same goal of creating a better world through our own little ways. Their initiative to increase the green cover of the world is consistent with Double A’s unique and sustainable Paper from KHAN-NA, which contributes a lasting positive impact to the environment and local Thai community”. Over 1.5 million farmers across Thailand are growing millions of paper trees along their KHAN-NA per year. The program is gradually expanding in neighbouring countries like Cambodia, Laos and Bangladesh. Meanwhile, Tree Planet founded in 2010, aims to be the company which plants the most trees in the world. Since 2011, Tree Planet has planted 470,000 trees in more than 25 locations in 7 countries, including the Double A map in Thailand. To join the initiative, the game can be played here: https://apps.facebook.com/treeplanetgame/.